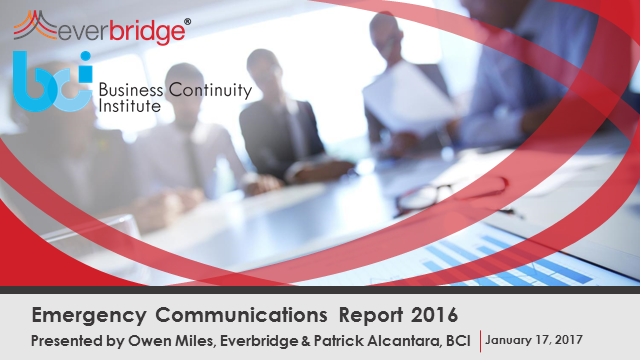 The Business Continuity Institute (BCI) has just published its latest research project, The Emergency Communications Report. The annual report surveyed over 600 industry professionals, reviewing emergency communications and security incident response plans for organizations around the world. This year’s findings revealed that global businesses are increasingly aware that true business resiliency is a company-wide initiative that involves taking accountability for the safety of all staff—whether they are located in the office, at home or on the road. Respondents indicated that a diversity of departments, including business continuity, IT, security, facilities, HR and more had a stake in the management, planning and enforcement of their organization’s emergency communications plans, but that an opportunity exists to optimize these processes to account for a global, mobile workforce, as well as the increased complexity and frequency of critical events and physical security incidents. Join Owen Miles, Managing Consultant from Everbridge, and Patrick Alcantara DBCI, Senior Research Associate at the BCI and the author of the report, for an engaging webinar that will discuss the research findings and share additional best practices for critical communications.